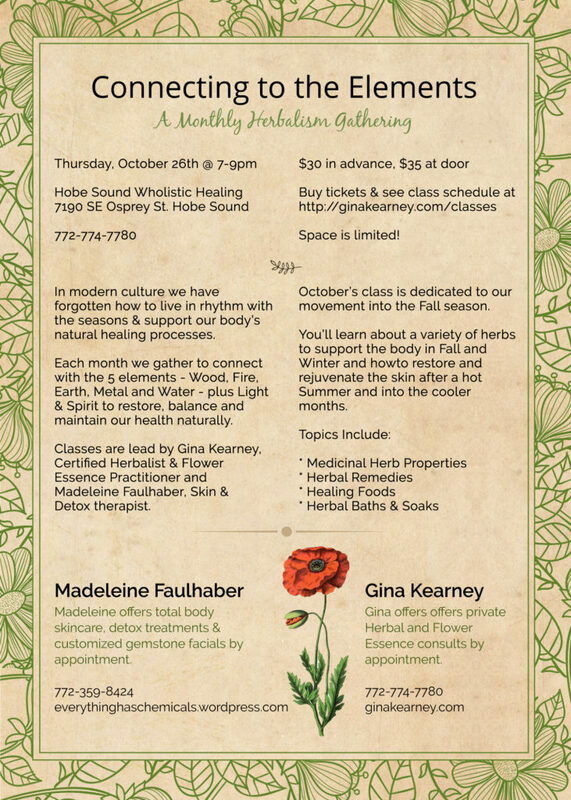 October’s class is dedicated to our movement into the Fall season. You’ll learn about a variety of herbs to support the body in Fall and Winter and how to restore and rejuvenate the skin after a hot Summer and into the cooler months. $30 in advance, $35 at door. Space is limited! In modern culture we have forgotten how to live in rhythm with the seasons and support our body’s natural healing processes. Each month we gather to connect with the 5 elements – Wood, Fire, Earth, Metal and Water – plus Light & Spirit to restore, balance and maintain our health naturally. Gina Kearney is a Certified Herbalist and Flower Essence Practitioner. She offers private Herbal and Flower Essence consuls by appointment. Madeleine Faulhaber is a Skin & Detox therapist. She offers total body skincare, detox treatments & customized gemstone facials by appointment.